The purpose of soil bioengineering is to stabilize and mitigate erosion issues, structure steep slopes, revegetate disturbed sites and decontaminate soil through planting. Steep slope and landslide management. Environnement PH inc. can see to the characterization of wetlands, participate in the event of landslides, and implement erosion control measures as well as sediment control methods. Protection of backfill and soil piles. Installation of impervious membrane, geomembrane and mulch. Installation of flotation and filtration collars. Limiting the impacts of a construction site! Implementing a sediment control program can reduce the impact of a construction site at its root. 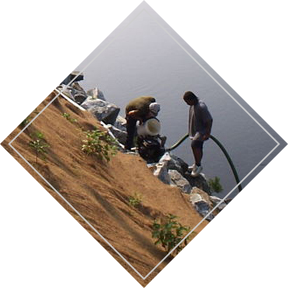 Contact us to learn how we can help you set up a sediment control program tailored to your needs. What are the impacts of sedimentary deposition in watercourses? Whether the erosion is anthropogenic (related to human activity) or natural, it has a significant impact on the quality of the environment and watercourses. The transport and deposition of sediments in watercourses generate important environmental, social and economic issues. Transfer of chemical substances in the environment following their adsorption or absorption by sediments. Decrease in watercourse depth and restriction of navigation. Dredging is then required. Decrease of the penetration of light into the water due to the presence of suspended sediments (which leads to an increase in fish mortality). Alteration of environmental conditions necessary to sustain the ecosystem (e.g. increase in watercourse temperature resulting from the adsorption of heat at the level of suspended particles). Proliferation of blue-green algae and aquatic plants (due to excessive inputs of phosphorus). Water distribution system interferences (e.g. increase in costs related to water supply systems connected to watercourses). Learn more about other Environnement PH services.